"The album is a good example of fixing things that I thought could be fixed," Paul Simon says. 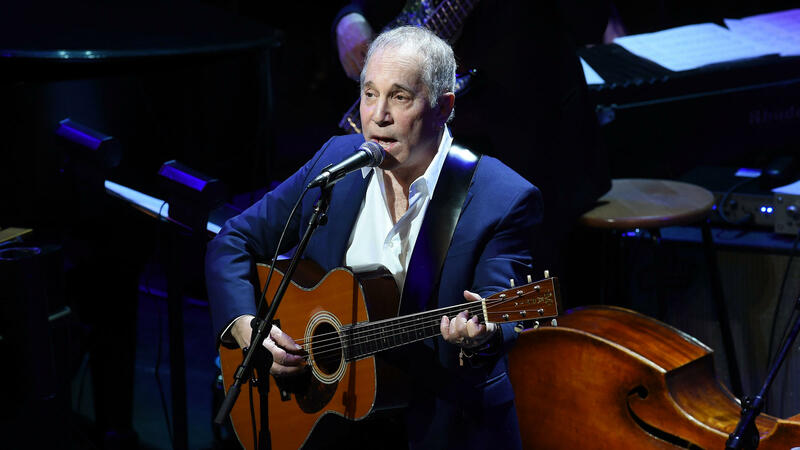 Paul Simon says he's ready to stop touring and retire from music. But first, he's going back through his discography to do a little tinkering. Simon has released his fourteenth and possibly final album. In the Blue Light, out now, is a collection of the famed singer-songwriter's older songs, rearranged — and in some cases, partially rewritten — to fix the things Simon didn't like about them the first time around. But don't call him a perfectionist. "I have nothing against the word," Simon says. "It just doesn't apply to me. You can't be perfect. It's either musical or it's not musical." Simon says the reworks of classics like "The Sound of Silence" and "Some Folks' Lives Roll Easy" are a good example of "fixing things that I thought could be fixed." Some of the tracks on the album have new verses while others have different production and emotive inflections. Although he doesn't feel he's made an absolutely flawless song, Simon says some of his hits, like his 1970 Grammy-winning signature song, "Bridge Over Troubled Water," have stood the test of time in a gratifying way. "I think the big measuring thing is, 'Will something last a hundred years?' If you write a song and it lasts a hundred years I'd say, 'Well, that's a hit.' And I have a couple songs that I have a shot at it, you know?" Simon spoke with NPR's David Greene about In the Blue Light, the luxury of fixing flaws while he still can and why his fans are really the last composers. Hear their conversation at the audio link. Nearly 60 years after writing his first song, Paul Simon is winding down his farewell tour. He is 76 years old and talking about retiring from music. But first, the famously meticulous songwriter has some unfinished business. On his new album "In The Blue Light," Simon has rerecorded and, in some cases, partially rewritten 10 songs he feels weren't quite up to snuff the first time around. He talked with David Greene. DAVID GREENE, BYLINE: You've been described as a perfectionist when it comes to your songs and your music. Is that a word you like? PAUL SIMON: I have nothing against the word. It just doesn't apply to me. SIMON: You can't be perfect. It's either musical or it's not musical. The ear goes to the irritant. When I hear something that I don't think is right, I want to change it. GREENE: Isn't that what a perfectionist does? Isn't that the definition of someone striving for perfection? SIMON: If you like. But it's not that I'm looking for the flaws. They search you out. GREENE: It's gnawing at me. GREENE: Well, I want to - let me talk through some of the songs in this album because that's exactly what you seem to be doing. SIMON: Oh, yeah. The album's a good example of fixing things that I thought could be fixed. GREENE: Well, this is the original recording from 1975 of "Some Folks' Lives Roll Easy." SIMON: (Singing) Some folks' lives roll easy as a breeze drifting through a summer night. GREENE: OK. And here is your new version. SIMON: (Singing) Some folks' lives roll easy as a breeze drifting through the summer night. GREENE: ...With the first version? SIMON: I thought it was a really good song that didn't pay off correctly in the last verse. This is the original version going back to the '70s. I thought the song would be a powerful song if I rewrote the last verse and made a point, which I didn't do the first time. SIMON: (Singing) The sunlight written in a scroll, the gift that God intended for us all. SIMON: No, not really. It's the listener who's in charge. And it's the listener who's the last composer. They write, in their heads, what they like. Sometimes when I hear people sing my songs, they sing a different lyric. And so I think, well, their brain hears this, and that's the lyric that they like. So they're the final composer because that's what they're singing. GREENE: Huh. I want to play another song. So this is the opening line of a song from 1983. GREENE: And so in this song, you have this famous Belgian surrealist artist and his wife, and they're big doo-wop fans. And we hear that. Let's listen here. SIMON: (Singing) ...They dance by the light of the moon to The Penguins, the Moonglows, The Orioles, The Five Satins - the deep, forbidden music they'd been longing for. GREENE: And so in the original, I mean, I could almost see them dancing to the music. And then the doo-wop comes in, and it seemed like this lovely touch. And then this is your new version of it. SIMON: (Singing) ...To The Penguins, The Moonglows, The Orioles and The Five Satins - the deep, forbidden music they'd been longing for. GREENE: So you really lose what, to me, was a fun aspect of the original, the doo-wop. But it's beautiful in its own right. So what were you trying to bring out instead? SIMON: When I wrote the original, I found this group of doo-wop singers from the '50s. I had a part that I wanted them to sing. But they came in with this whole part they wrote. But I didn't have the heart to tell them, don't do that because they - obviously, they'd worked so hard at it. So I just left it there. But it's not the way I wanted it to be. Again - you know, I don't know whether you would say this was being a perfectionist or whether this was coming closer to expressing what it is that I felt or intuited about the song. SIMON: (Singing) For now and ever after, as it was before, Rene and Georgette Magritte with their dog after the war. GREENE: Is there a song that you've never heard a flaw in, a song where you've listened back and you've said, like, you know, there are no little flaws there that - I'm OK with just how it sounds? SIMON: Maybe. But as time goes by, you change your mind anyway about what a flawless performance is. Some of the songs are effective and last in a way that's, you know, very gratifying. For example, I wrote "The Sound Of Silence" when I was 21 or 22 years old, which - I have no idea how I possibly wrote that song at that age. But that song has lasted all of these years. SIMON: (Singing) And the vision that was planted in my brain still remains within the sound of silence. GREENE: It's been such a pleasure talking to you, Paul Simon. Really an honor. Thank you. SIMON: Thanks. Thanks for having me. SIMON AND GARFUNKEL: (Singing) Like a bridge... Transcript provided by NPR, Copyright NPR.